We have learnt to locate rational numbers on the number line. Is it possible to locate any irrational number on a number line? By using calculator we find that the value of =1.41421356237310. . .and = 2.23606797749979. . . . The numbers such as , , , are not rational numbers. They have non recurring and non terminating decimal points. They are called surds. with a >0 and n>1. ‘a’ is called ‘radicand’ and ‘n’ is called ‘order’ . is the root sign. Surds can be expressed in exponential (index) forms as shown below. Surds which have 1 as its rational co- efficient are called ‘pure surds’. The examples are , , . Surds which have rational co-efficients other than 1 are called ‘mixed surds’. The examples are 5 ,8 ,4 (Their co –efficients are 5, 8, 4 respectively). Surds whose order and radicands are same in their simplest form are called ‘like surds’. The examples are 5 ,7 .8 ( Their order is two and radicand is 3). Since the order of two surds(3 and 4) are different we need to convert their orders in to same number. The smallest common order is the LCM of 3 and 4 which is 12. Note : For most of operation on surds, it is necessary that they are converted first to same orders. We have learnt to represent integers and fractions on a number line. We have also studied earlier that by division method (Section 1.5.2), we can find the value of to the required number of decimal places. With non repeating and non terminating decimal value of , we can not accurately represent on a number line. 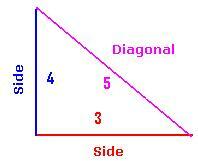 But, with the help of Pythagoras theorem we can represent irrational number of the form on a number line accurately. Thus, if we can construct a right angled triangle whose sides are , 1 (say base of and height of 1), then the hypotenuse gives the value of . Draw a number line and mark O. Mark the point A, say at a distance of 1cm from O. Therefore OA=1cm. Thus, we have a right angled triangle OAB whose sides OA = AB = 1cm. With OB as radius, draw an arc to cut the number line at P.
1.7.1 Problem 2: Locate on the number line. At P draw a perpendicular line to the number line. With P as center and 1cm as radius draw an arc to cut this perpendicular line at C.
With OC as radius draw an arc to cut the number line at Q. In the same way we can locate for any positive integer n after has been located. This is called Wheel of Theodorus named after a Greece philosopher, Theodorus. Also, every point on the number line represents a unique real number. We have learnt how to represent rational numbers on the number line in 1.1 and how to represent on the number line in this section. We have also learnt that every irrational number has a decimal representation. Thus, if we could represent a decimal number on the number line, then we can conclude that every irrational number can also be represented on the number line. 1.7.1 Problem 2: Locate 3.1415 on the number line. We know that the given number 3.1415 lies in between 3 and 4. Draw a number line with a large scale. Identify 3 and 4 on this line. Divide the portion between 3 and 4 into 10 equal parts. Identify 3.1 and 3.2 on this line. Again divide the portion between 3.1 and 3.2 into 10 equal parts. Identify 3.14 and 3.15 on this line. Again divide the portion between 3.14 and 3.15 into 10 equal parts. Identify 3.141 and 3.142 on this line. Again divide the portion between 3.141 and 3.142 into 10 equal parts. Identify 3.1415 on this line. Thus we have located on the number line to an approximate value of 3.1415. In this way we conclude that any irrational number can be represented on the number line. 1.7.1 Problem 3: Locating when x is any positive number (rational or irrational) on the number line. We know that any real number can be represented in decimal form. Similarly, we can represent (x+1)/2 and (x-1)/2 on the number line, as they are also real numbers. 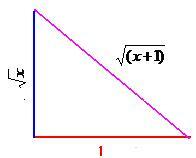 Then Construct a right angled triangle with base (AB) = (x-1)/2 and hypotenuse (AC) = (x+1)/2. Note: If orders are different then find LCM of orders to convert them to same order. The process of multiplication of two irrational numbers to get their product as a rational number is called ‘rationalisation’. The two irrational numbers are called rationalising factors of each other. We have seen earlier that is an irrational number. What about the product of and 3 ? *3 = 3*2 = 6 which is a rational number. Thus 3 is a rationalising factor of . Similarly is also a rationalising factor of . Also note that 1/ is also a rationalizing factor of . Thus rationalising factor is not unique. In fact the product of a rational number and the rationalising factor is also a rationalising factor. We are required to convert the denominator into a rational number. Thus 1/( +2) is the rationalising factor of the denominator. If the product of two mixed surds a+ and a- (where a and b are rational numbers) is a rational number then they are called conjugate surds and a+ and a- are conjugate to each other.